The Butterfly House contains over 1,000 butterflies with many different species from North & South America and Asia. The facility was built with the idea of developing beautiful gardens in a controlled environment to exhibit butterflies to the general public. An opportunity to learn about the life cycle of the butterfly and how to promote a healthy environment for these special insects will be provided as well. The average life span of the butterfly is 2 to 3 weeks, so each week we introduce new species. Throughout the season we will have over 100 different species, so multiple visits can be rewarding. Our experienced staff are available to answer your questions. The Butterfly House welcomes groups! Feel free to make reservations for birthday parties, school field trips, senior citizen gatherings, weddings and more. For more information please call 419-872-1731. Discount: Groups with 30 or more will receive $1 off per person. Unlike most other insects in temperate climates, Monarch Butterflies cannot survive a long cold winter. Instead, spend the winter in roosting spots. Monarchs west of the Rocky Mountains travel to small groves of trees along the California coast. Those east of the Rocky Mountains fly farther south to the mountains of Mexico. The Monarch’s migration is driven by seasonal changes. Day length and temperature changes influence the movement of the Monarch. In all the world, no butterflies migrate like the Monarchs of North America. They travel much farther than all other tropical butterflies, up to three thousand miles. They are the only butterflies to make such a long, two way migration every year. Amazingly, they fly in masses to the same winter roosts, often to the exact same trees. Their migration is more the type we expect from birds or whales. However, unlike whales, individuals only make the round trip once. It is their children’s grandchildren that return south the following fall. When the late summer and early fall Monarchs emerge from their pupae, or chrysalides, they are biologically and behaviorally different from those emerging in the summer. The shorter days and cooler air of late summer trigger changes. In Ohio this occurs around the end of August. Even though these butterflies look like the summer adults, they won’t mate or lay eggs until the following spring. Instead, their small bodies prepare for a strenuous flight. Otherwise solitary animals, they often cluster at night while moving ever southward. If they linger too long, they won’t be able to make the journey; because they are cold-blooded, they are unable to fly in cold weather. Fat, stored in the abdomen, is a critical element of their survival for the winter. This fat not only fuels their flight of one to three thousand miles, but must last until the next spring when they begin the flight back north. As they migrate southward, Monarchs stop to nectar, and they actually gain weight during the trip! Some researchers think that Monarchs conserve their ”fuel” in flight by gliding on air currents as they travel south. This is an area of great interest for researchers; there are many unanswered questions about how these small organisms are able to travel so far. Another unsolved mystery is how the Monarchs find the over wintering sites each year. Some how they know their way, even though the butterflies returning to Mexico or California each fall are the great-great-grandchildren of the butterflies that left the previous spring. No one knows exactly how their homing system works; it is another of the many unanswered questions in the butterfly world. Every spring, millions of monarch butterflies re-populate eastern North America after surviving the winter in the high mountains west of Mexico City. They flew up to 2,500 miles to get there last fall and spent the winter living off their fat reserves. With just a few weeks to live, they’ll race to produce the next generation. The following fall, by instinct alone, the great-grandchildren of these butterflies will return to the very same mountain sanctuaries. The information for this incredible journey is somehow passed from generation to generation so that miraculously the butterflies return to a place they’ve never seen before. Plant your garden in full sun. Butterflies need sun to warm their bodies for flight. Also, be sure the area is sheltered from the wind, by trees, shrubs, or a building. Plant butterfly-attracting flowers. Butterflies are attracted to flowers where they can drink nectar. Select plants that are native to the area and they will attract local butterflies. Plant in masses, not in single plants, to optimize colors and scents and to minimize weeds. Select a number of plant varieties so the garden is in bloom all season long. Mix annuals and perennials for optimal effect. Include host plants in your garden. If you want more butterflies in your garden provide for caterpillars. Butterflies lay their eggs on host plants that the emerging caterpillar will eat. You may want to designate a separate area for these, away from the main flower garden. Use colorful plants. Butterflies see more colors than humans do. They seem to prefer red, orange, yellow, purple, and dark pink with single or clustered flowers. A large colorful garden is easy for butterflies to find and encourages them to stay longer. Place dark stones in your garden. Butterflies will lay on the stones with their wings open to warm their bodies. This is known as basking. Only when their body temperature is about 85 – 100°F can they fly well. Place a bucket of wet sand or a small mud puddle near your garden – an important source of nutrients such as amino acids and salt for male butterflies. These nutrients are needed for survival and reproduction. When males gather in these areas, it is called puddling. Do not use chemical pesticides. Butterflies are insects Pesticides will kill your butterflies, caterpillars and other useful insects. Try marigolds, petunias, mint, and other herbs that naturally repel insect pests. Encourage ladybugs and dragonflies. When absolutely necessary wash pests away with your own homemade spray of mild soapsuds. Also, try to develop a tolerance for a chewed leaf or two. Each butterfly needs a specific host plat where it will lay eggs. Learn about local butterflies, so you can provide the right match of plants to make your garden the butterflies’ favorite. All your hard work will be worth the effort as the butterflies fly from flower to flower enjoying the nectar plants and begin a new life cycle on the host plants in your own back yard. While you're here, make to sure stop into our gift shop and pick up a keepsake to remember your great experience at The Butterfly House! 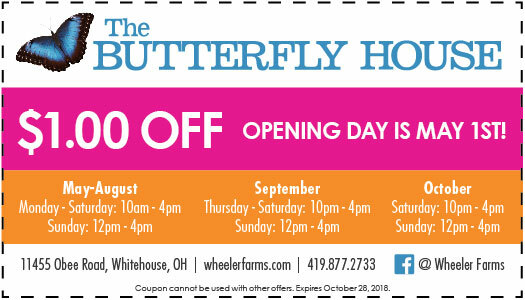 The Butterfly House is located at 11455 Obee Road in Whitehouse, Ohio. We're right next to the Corn Maze and The Stables.